Typhoon Ineng news updates and storm warning signals as of Wednesday, August 19, 2015 from state weather bureau PAGASA are posted here. As of 11 a.m. today, the Philippine Atmospheric, Geophysical and Astronomical Services Administration reported that Bagyong Ineng maintained its strength as it moves closer to extreme Northern Luzon. At 12 noon, the tropical cyclone was spotted 780 kilometers East of Aparri, Cagayan packing maximum sustained winds of 180 kilometers per hour near the center and gusts of up to 215 kph. It is moving West at 23 kph. PAGASA warned that a storm surge with wave height of 4.1 to 14 meters is possible at coastal areas. State forecasters said the wave height in the open sea is 1.25 to 4 meters. They estimated the rainfall amount to be moderate to heavy within the 700-km diameter of Typhoon Ineng. The weather agency further said that the enhanced Habagat is currently affecting Palawan and Visayas and occasional rains over the western section of Luzon including Metro Manila are possible beginning Thursday until early next week. 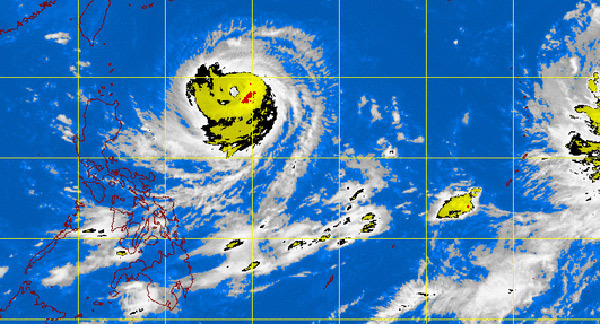 Sea travel is risky over the eastern seaboard of Luzon, PAGASA added.